This is a 3 under 3 deep zone dog from a 7 DB personnel package used by the NY Jets back in the 2011 season. End - The end is slow to enter the pass rush. This could be a bad get off by the DE but it could also be a spy technique. With four pass rusher on the opposite edge, I could see the away End being used as a spy to clean up a QB. As the QB tries to work away from the pressure the spy is there to apply late pressure and prevent the QB from escaping the pocket. By being slow to enter the pass rush, the End avoids running himself out of play. I don't know the specific coaching points for his technique. It is an interesting idea to use a rusher opposite an overload rush as a spy. The technique of the End and the Dime are critical to making this pressure effective. The End doesn't use a traditional long stick. 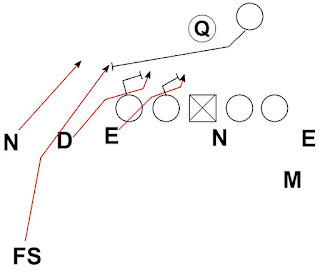 On a traditional long stick the action of the DE is very lateral. 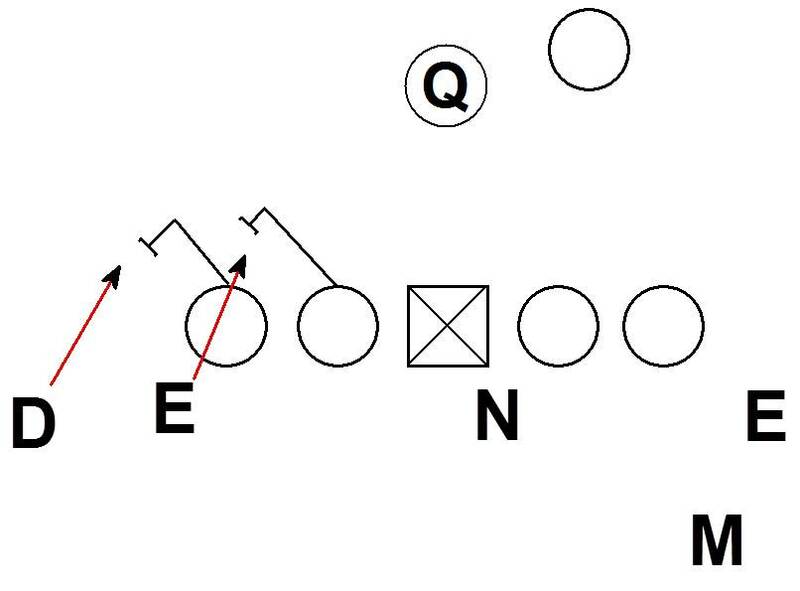 The lateral action allows the guard to pass the long stack to the Center while sitting for a new B gap pass rush threat. The Jets' DE instead works up the field before going lateral. The result is the Guard is forced to set to the DE threatening the B Gap with his first step. The Guard cannot ignore the threat. 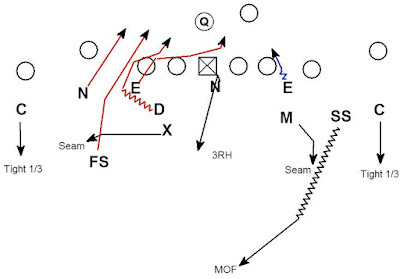 Initially the rush feels like a standard rush where the Tackle will pick up the Dime and the Guard will pick up the End. Once the End starts to go lateral and inside the Guard is forced to change direction. By the time the Guard realizes what is happening and tries to pass the End to the Center it is too late. The Guard redirects back outside to the B gap but ultimately blocks no one. 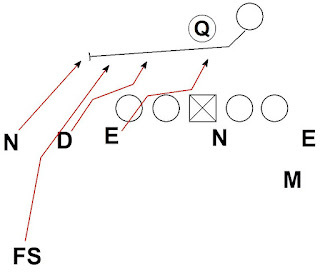 The up and under rush of the Dime creates a challenge for the Tackle. The tackle is initially forced to set wide. 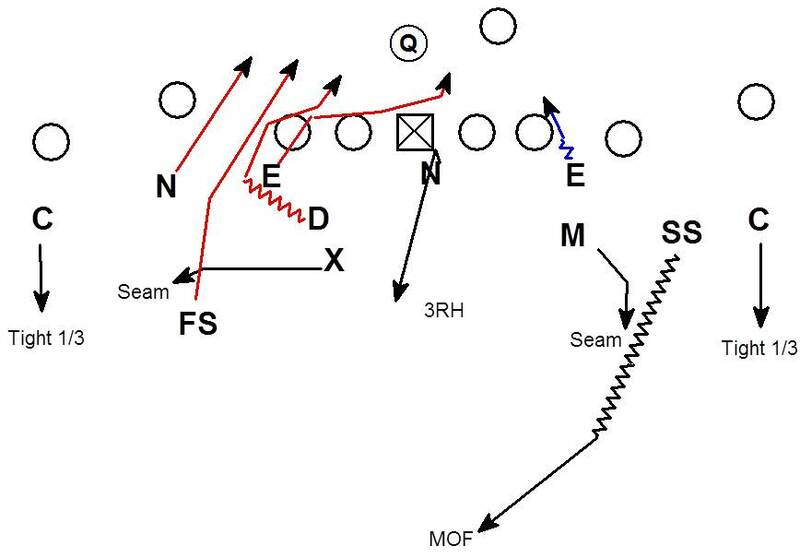 With the DE going inside, the most likely rush path for the Dime is to stay outside. It is less likely to have two outside rushers working inside but that is exactly what is happening. The tackle was not ready for the Dime to go up and under. The combination of the rush violating expectations and the Tackle being forced to redirect vs. a rushing DB results in the Tackle being beaten 1 on 1. While the Tackle and Guard are both in a bind inside, the RB also has a difficult task on the edge. The RB scans across the formation and picks up the rushing Nickel. The FS ends up getting a free run and a sack. What is the alternative for the offense? The RB could have scanned to the inside rusher leaving the widest rusher free. The QB would need to throw hot off the Nickel in that case. This solution is completely impractical. 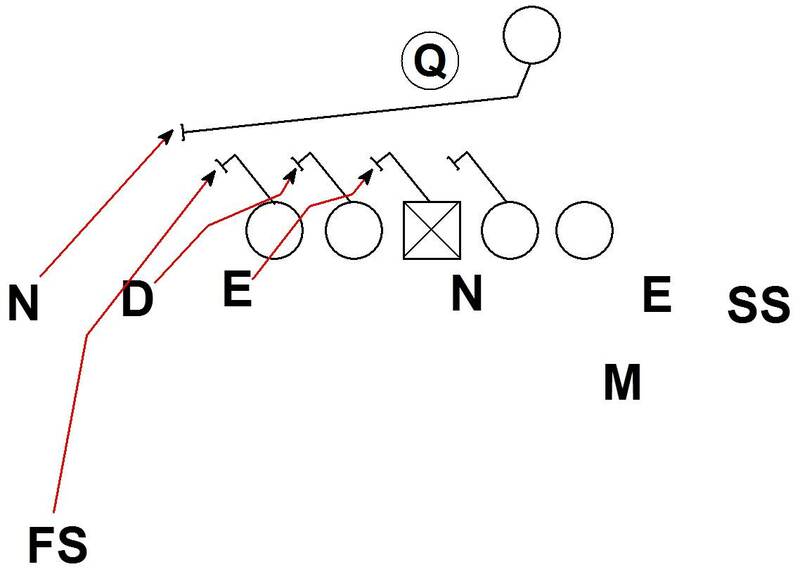 The Nickel is blitzing from the first level while the FS is blitzing from depth. The RB is forced to block the Nickel because the Nickel is the first threat. By the time the 2nd threat from the FS arrives the RB is already committed to block the Nickel. Another factor in the success of the rush is the back side of the pressure. The offense could slide to the pressure and have the numbers to block the rush. 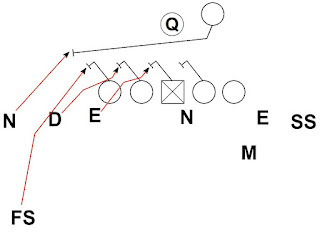 One issue is the offense does not know the Nose is going to drop into coverage. By stemming the Nose to a 1 technique the Center is discouraged from sliding to the pressure. 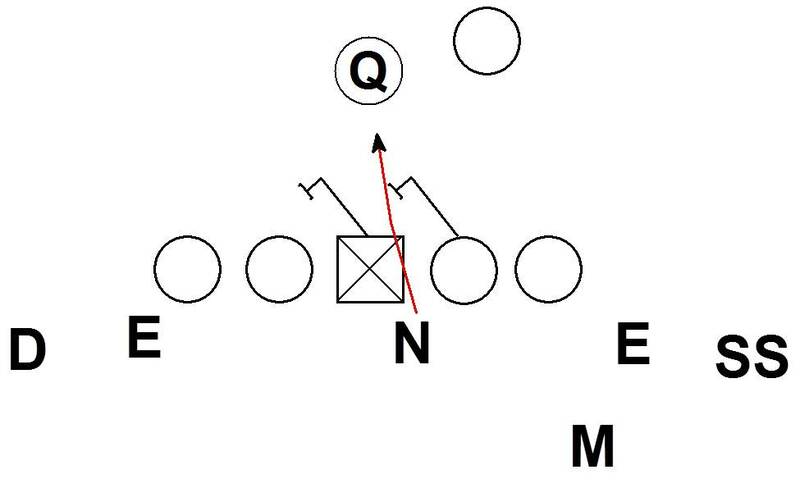 If the Center slides away from the Nose, the Nose has an inside 1 on 1 rush opportunity vs. Guard. 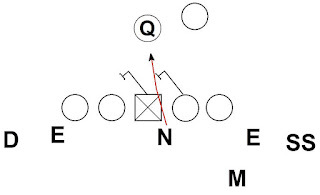 The Center instead sets to the Nose which allows the defense to overload the pressure side. The early threat of pressure from the Mike and SS also helps prevent the OL from sliding the protection to the pressure. The SS being down near the LOS before popping out creates the threat of pressure. 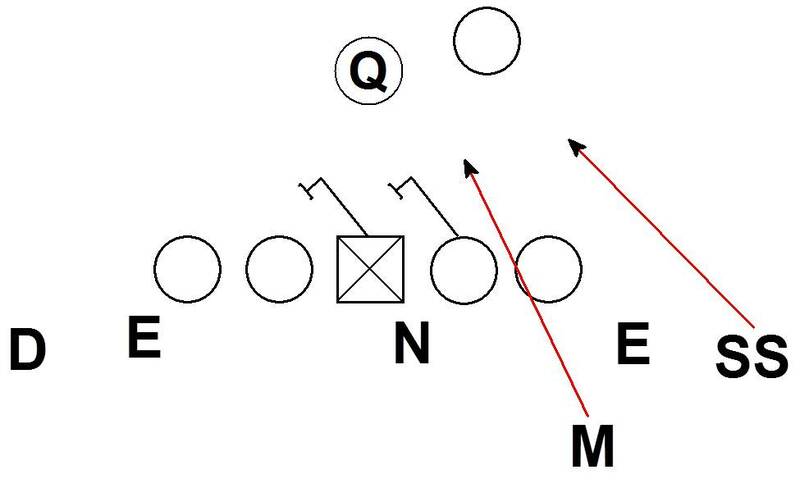 If the protection did slide, the defense could easily create a 2 on 1 rush vs. the RB by bringing the Mike and SS. I don't have much love for the man personally, but boy can he design a blitz. All that scheme and disguise to ensure they can't slide, and then even if they half slide there's a fourth rusher on that side. Amazing. By the way do you know who the X is in Ryan's scheme? I've read through his playbook but he never says. The X is the 7th DB. Nickel is the 5th, Dime is the 6th, and Xtra is 7th. On this play it is #26 CB Ellis Lankster. What does the term "scrape" mean? There is no universal terminology in football. In my experience scrape is most commonly used for an inside out technique by a defender. The path of the defender should be so tight with the end of the line of scrimmage there is no daylight. Scrape describes the path of being so close you are touching as you slide by.